This is a Web site creation tool. This is a Web Site Creation tool. WebIdeaTree makes you efficient, and you stay focused on what you mean : organize your ideas in a tree, add some text, images or links to documents, a style and structure template, and instantly build the whole Site. It works on Windows 7, Windows Server 2008 and 2003, Windows Vista, Windows XP, Windows 2000 and NT4. MicroFTP 2000 is a free, easy-to-use FTP Client program that will allow you to quickly transfer files to and from any FTP Web Site. 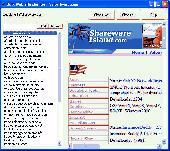 MicroFTP 2000 can also be used for Web Site Creation and routine maintenance. Standard FTP commands are incorporated in a simple, streamlined graphical user interface.